"The Fundraiser For Computer Equipment Advancement"
This isn't a national telethon or anything, it's just a small campaign to get new computer equipment to an individual freelance artist. (that would be me) As my system has really been showing it's age and limitations as of late and I'm finding myself doing and planning on doing more and more digital tomfoolery, it's turning into a necessity to do a decent upgrade. So, I've scheduled in some massive overtime, pulled a lot of hard to find items out of storage, started putting them up on Ebay, and plan on opening up for commissions as soon as I get all my Artist's Proof sketches completed. I also have plans to open up a For Sale page here on my website and will post when I get to that. For now, I'll just keep plugging away at the drawing table and post a pic of this little Spider-Man 97 Sketchagragh of Spidey vs Venom I have up on Ebay. Heres an advanced thank you for anyone helping me out with this. Studio Journal Entry #3: Somewhere To Put My $#!T. I have a very happy studio right now. After a very long backorder and wait, my new filing system is in and working it's magik mojo. It started with a trip to Sears with a mission in mind and a tape measure in hand and now I have very little in the way of "piles of crap" to step over. 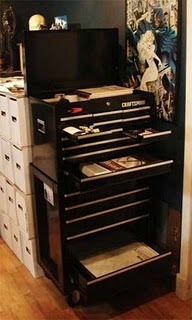 Yes thats a Craftsman tool chest with all my frequently used art supplies and all my pads ands paper. Who needs to spend gads of cash on specialty flat files, when for half the price and twice the coolness, you can roll one of these babies around your office. Due to the size of comic pages, I really wanted this specific one because of it's dimensions. Now I've got a nice safe place to store all my originals with easy access to everything I need. Well that was too long between posts. 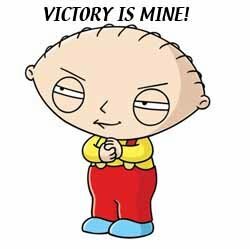 Holidays and all that work stuff, blah blah blah. I took a 3 day weekend to work on the Studio and pretty much wiped myself out doing so, but it's done. Made a few trips to Home Depot, Staples, and my neighbors house up the street to raid his workshop for supplies and any tools I didn't have. I redid the flooring, the sub-flooring, finished the trim work, patched up some drywall areas, and even repainted the entire room. I returned all the Comic boxes and reworked the layout of the room. 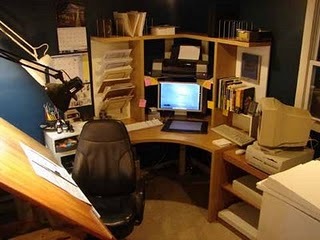 One of the problems about the old layout was I had a computer station separate from my drawing table and I found myself doing the up and down back and forth thing constantly when I'm referencing something or just needing the computer while I worked. A big waste of time. So I got rid of one of the two chairs and reconfigured the table and desk into one cohesive station. It's like a really cool drawing cockpit. Only one setback... the drawing table I was using, which was the one I had when I was in school back in the early 90's, decided to finally die in the moving process and let go of some of it's welds. "Well. I guess it was time for that new Drawing Table after all." So here was my chance to make that drawing table I've always wanted. I broke down an old Dinning room table, used the top and the legs, made a few trips back to Home Depot, reworked it and used some cool hardware here and there. I added some features that I've been thinking about for awhile and just about finished it up Monday night. There are only some minor details on the room I need to finish up and some spaces left on the wall for some new pictures, but over all I'm really please with the way it came out. Now that I'm 3 days behind schedule, I guess it's time to get back to work and try out the new digs. I'm so excited. 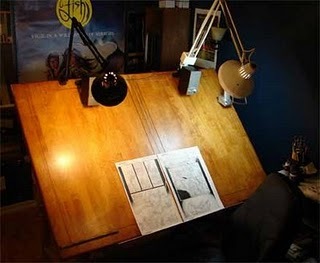 Now that's a Drawing Table.